AVONDALE, Ariz. (April 1, 2016) – Helio Castroneves was awarded a crown for being the speed king following a record-breaking qualifying performance at the Desert Diamond West Valley Phoenix Grand Prix. It was an appropriate bestowal considering Castroneves’ qualifying prowess. Driving the No. 3 REV Group Team Penske Chevrolet, Castroneves earned the Verizon P1 Award at Phoenix International Raceway with a two-lap average speed of 192.324 mph. His first lap of 19.0997 seconds (192.631 mph) established the new track record for the 1.022-mile oval that stood for 20 years prior to the qualifying session. It gives Castroneves 46 career pole positions, the fourth most in Indy car history, and 28 on ovals. The 2002 PIR race winner will lead the 22-car field to the green flag for the 250-lap race under the lights (8:30 p.m. 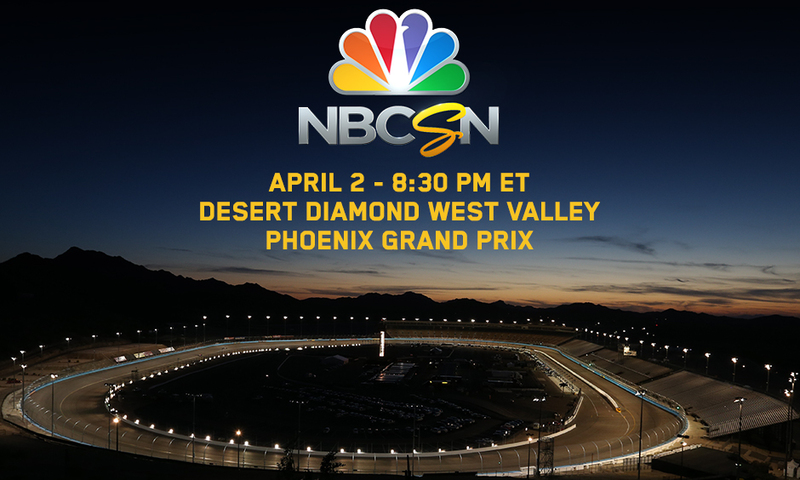 ET, NBCSN and Advance Auto Parts INDYCAR Radio Network). “It’s an honor to be breaking the record, which has been holding for 20 years, and now we’re able to show that Verizon IndyCar Series cars are fast,” Castroneves said after receiving the crown in pit lane from former track record-holder Arie Luyendyk, now an INDYCAR race steward. “The REV Group car was really on rails,” Castroneves said. “We came here in the preseason, we showed that and we kept going. The temperatures were really difficult because of the temperature and you’ve got to push to the limit, and we definitely pushed to the limit. Tony Kanaan, Castroneves’ longtime friend and rival from Brazil, qualified second at 191.511 mph in the No. 10 GE LED Chip Ganassi Racing Chevrolet. It marks the 41-year-old’s first front-row qualifying effort since Iowa Speedway last July. “If you look at the results, I’m always being extremely competitive at the mile ovals,” said Kanaan, who won at PIR in 2003 and ’04. “You look at Milwaukee, you look at Iowa, you look at here – I think this is a little bit of both. Obviously I can’t make miracles if I don’t have the car, but I think my engineer described it the best to me. Verizon IndyCar Series points leader Juan Pablo Montoya, who won the season opener March 13 at the Firestone Grand Prix of St. Petersburg, qualified third at 191.366 mph. The only incident in qualifying came when Carlos Munoz spun and crashed in Turn 1 on his first qualifying lap in the No. 26 Andretti Autosport Honda. It mirrored a pair of incidents in which Takuma Sato (No. 14 ABC Supply/AJ Foyt Racing Honda) and James Hinchcliffe (No. 5 Arrow Schmidt Peterson Motorsports Honda) crashed in morning practice. Neither Sato nor Hinchcliffe was able to make a qualifying attempt as their crews repaired their cars. All three drivers were cleared to drive in the race. Sato will start 20th, Munoz 21st and Hinchcliffe 22nd based on entrant points. The Verizon IndyCar Series makes its return to historic Phoenix International Raceway following an 11-year absence. From 1964 to 2005, 61 Indy car races were conducted at the oval in the desert. Andretti Autosport confirmed that veteran driver and NBCSN analyst Townsend Bell will drive its fifth entry for the 100th Running of the Indianapolis 500 Mile Race presented by PennGrade Motor Oil in May. The 40-year-old American will drive the No. 29 Honda. Bell has made nine career Indianapolis 500 starts with a best finish of fourth in 2009. He won the 2001 Indy Lights championship and has victories in a pair of prestigious sports car endurance races, the Rolex 24 At Daytona and Mobil 1 Twelve Hours of Sebring. “Driving in the 100th Running of the Indy 500 with Andretti Autosport is a great opportunity,” Bell said. “I think I’ll benefit from being part of a strong, multi-car team with a winning pedigree at Indy. Team owner Michael Andretti was pleased to add Bell to the driver lineup that includes Marco Andretti, Ryan Hunter-Reay, Carlos Munoz and Alexander Rossi. “If you look at his record at Indianapolis, he does very well there,” Michael Andretti said. “He hasn’t been with the top teams, but it seems like he’s always there in the top 10 and I feel like if we can put a good car under him, he has a good shot at winning the race.rticipate in a question-and-answer session with fans at 3 p.m. (local time) on PIR’s Fan Midway Stage, with all attending legends introduced at 5 p.m. during prerace driver introductions.